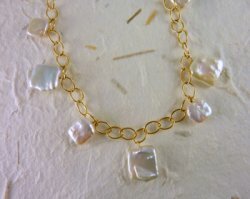 Fresh Water Pearls Necklace by Sue Roland. Sue has gathered fresh water pearls with a squared shape for this intriging short necklace. The chain adjusts the length from 15" to 17". Chain and findings are 12K Gold Filled.